Home→Blog→Spaceman Central→Articles→All Of Patrick Troughton’s Doctor Who Episodes Reviewed Here! ← All Of William Hartnell’s Episodes Reviewed On Old Doctor Who! We have now finished reviewing all of Patrick Troughton’s – Second Doctor episodes, in the episodes section. The idea of replacing the main character at the height of a show’s popularity, was a major risk for all concerned. The newly regenerated Second Doctor in the First Doctor’s clothing – “Power Of The Daleks” – 1966. Not least Troughton himself, who was required to follow in the footsteps of the extremely popular and out-going William Hartnell. However, instead of backfiring. It infact become the catalyst for the next 23 years; allowing the ability to change the lead actor (and direction and tone of the show) – every 3 to 4 years. The Doctor tries to remember who he is, in “The Power Of The Daleks” – 1966. Troughton set about taking his Doctor character in a completely different direction to his predecessor. Gone was the grumpy Grandad exterior of the First Doctor, replaced by the cooler younger 60’s dad who recounted parables – rather than answer a direct question. The Doctor pretends to be an Atlantian Priest in “The Underwater Menace” – 1966. At producer Sydney Newman’s insistence, the Second Doctor was modelled as a “cosmic-hobo” – a cross between James Stewart and Charlie Chaplin. Given a 60’s Beatles-style mop-top, flute, stovepipe hat and the sonic screwdriver – even made it’s debut. The Second Doctor began his tenure in a rather confused and forgetful state, in The Power of the Daleks. Unable to remember his identity, his situation or even how to pilot the Tardis. The second Doctor spends some time musing. The trademark Stovepipe hat was soon abandoned after season 4. This was the first time the “post-regeneration stress blues” made an appearance, although the term “regeneration” was not coined until the Pertwee era. Here, it was known as a “change of face”. Troughton stretched his range by playing both the Doctor and the evil Salamander in “Enemy Of The World”" – 1968. Once the blues had subsided, the Doctor began to grow into his new character. This Doctor was less judgemental and more thoughtful, slightly less alien but still mysterious and more eccentric than before. With a new young energy and attitude to boot. This Second Doctor didn’t travel with as many companions as other incarnations. This was mainly due to the Doctor deciding to keep Jamie McCrimmon, as his mainstay – for almost the full 3 year run. The Doctor, Jamie and the Brigadier talk tatics – in “The Invasion” – 1969. The Doctor met and saved Jamie from the aftermath of the Battle Of Culloden, in The Highlanders. The Doctor originally travelled with First Doctor companions; Ben and Polly but they decided to leave – in The Faceless Ones. 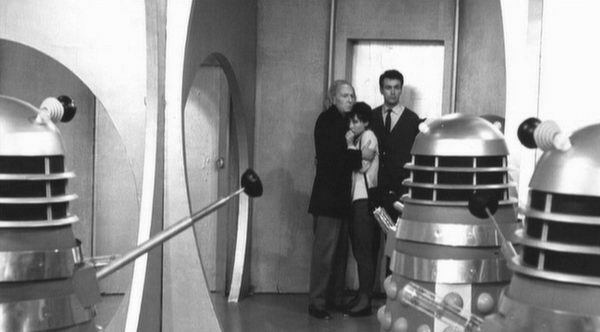 Jamie and Victoria harrassed by a Dalek, in “Evil Of The Daleks” – 1967. Victoria Waterfield joined the crew for a time and then left and was then replaced by Zoe Heriot. The Doctor also met and befriended Lethbridge-Stewart who would go on to create UNIT. UNIT and the Brigadier would feature prominently, throughout the Third Doctor era. Troughton himself – was insistent that he only commit to the show for 3 seasons/years only, due to his fear of being typecast. This was to be (bar Colin Baker) the minimum expected run; for all future incarnations. 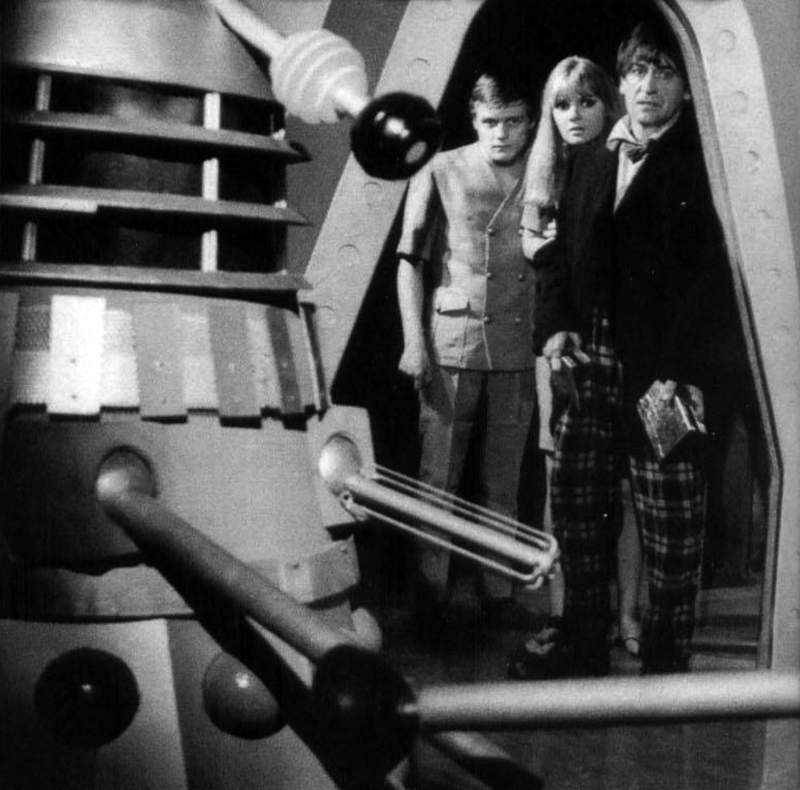 The Dalek Emporer on Skaro – “The Evil Of The Daleks” – 1967. The Doctor encountered the ever popular Daleks only twice in The Power of the Daleks and in the (almost) Dalek swansong; The Evil of the Daleks. The latter was intended to be the end of the Daleks, for good. The Cybermen outside St Pauls’ Cathedral London – “The Invasion” – 1968. However, it was the Cybermen who really came into their own – in the Troughton era, with a record 4 appearances; The Moonbase, The Tomb of the Cybermen, The Wheel In Space and The Invasion. Troughton’s era also signalled a breakaway from the pure historical Hartnell episodes and went for a more science fiction edge with plenty of aliens. Indeed, Troughton’s era is also known as the “Monster era”. The Doctor with some of his enemies – “The War Games” – 1969. Other featured monsters, included the Troughton-synomous monsters; The Yeti. Who appeared in 2 story-linked adventures; The Abominable Snowmen and The Web of Fear. The Ice Warriors also made an impact in The Ice Warriors and The Seeds of Death. The Second Doctor’s regeneration is started by the Time Lords – “The War Games” – 1969. Troughton era finally gave a name and face to the Doctor’s race, as he was brought home to Gallifrey for trial for his past crimes in The War Games. Troughton himself, is the most featured Doctor – in terms of past Doctor reprises. Featuring in, 3 follow-up adventures. The Three Doctors, The Five Doctors and The Two Doctors. Troughton returned in the 10th anniversary special – “The Three Doctors” – 1973. Indeed, Troughton’s approach can be credited as the first truly modern basis for every portrayal of the Doctor. All subsequent actors in the role, credit Troughton as having influenced their own take on the character – to some degree. So, what was your favourite Troughton episode?